Friday, April 30, 2010 \PM\.\Fri\. The investigators used functional neuroimaging (fMRI) to study a sample of committed Democrats and Republicans during the three months prior to the U.S. Presidential election of 2004. The Democrats and Republicans were given a reasoning task in which they had to evaluate threatening information about their own candidate. During the task, the subjects underwent fMRI to see what parts of their brain were active. What the researchers found was striking. “We did not see any increased activation of the parts of the brain normally engaged during reasoning,” says Drew Westen, director of clinical psychology at Emory who led the study. “What we saw instead was a network of emotion circuits lighting up, including circuits hypothesized to be involved in regulating emotion, and circuits known to be involved in resolving conflicts.” Westen and his colleagues will present their findings at the Annual Conference of the Society for Personality and Social Psychology Jan. 28. Once partisans had come to completely biased conclusions — essentially finding ways to ignore information that could not be rationally discounted — not only did circuits that mediate negative emotions like sadness and disgust turn off, but subjects got a blast of activation in circuits involved in reward — similar to what addicts receive when they get their fix, Westen explains. Friday, April 30, 2010 \AM\.\Fri\. Earlier this week I referred in this thread to General Sheridan’s quip about Hell and Texas. Here is the background story on Sheridan’s comparison of the Hot Place and the Hot State. Phil Sheridan could be a nasty piece of work on duty. 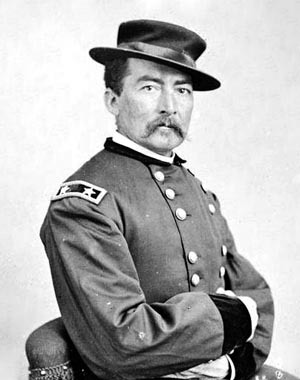 A bantam Irish Catholic born in Albany, New York on March 6, 1831, to Irish immigrants, Sheridan carved a career in the Army by sheer hard work and a ferocious will to win. He had a hard streak of ruthlessness that Confederates, Indians and the many officers he sacked for incompetence could attest to. His quote, “If a crow wants to fly down the Shenandoah, he must carry his provisions with him.” after he ordered the burning of crops in the Shenandoah Valley in 1864 to deny them to Confederate troops indicated just how hard a man he could be when waging war. Off duty he was completely different. He had the traditional Irish gift of gab and in social settings was charming and friendly. Thursday, April 29, 2010 \PM\.\Thu\. Apparently President Obama is doing his best to paint the Tea Party movement as a group of extremists and racists. Witness the video below as an army of riot police in full riot gear and snipers on rooftops wield their weapons to intimidate the Tea Party protesters. Thursday, April 29, 2010 \AM\.\Thu\. The Reform of the Reform has begun. The purge of sacrilege, heresy, and perversion from the Church has begun. What a glorious day! In our world today we are living in what I would refer to as the Liberal Dystopia of Political Correctness. This thing that our current Holy Father warned us about. As secular humanism continues its march towards a Dictatorship of Relativism we innocent bystanders suffer the consequences of its fruits when prejudice is rewarded and common sense rejected. An excellent example of this dictatorship of relativism or as I would name it, liberal dystopia, is the United Kingdom’s Foreign Office anti-Catholic memo on the preparation of Pope Benedict’s visit to Britain. In this event Anjoum Noorani, another Oxford educated civil servant* of the U.K. Foreign Office, who headed the Papal Visit Team that was planning the Pope’s visit to Britain was only verbally reprimanded for his part in approving and distributing the anti-Catholic memo. What makes this worse is that the Foreign Office advertised the requirements for the position to lead the Papal Visit Team as “Prior knowledge of the Catholic church is not necessary“. Illegal Immigration: A Winning Issue for Democrats? Some Democrats think that the Arizona law cracking down on illegal aliens will save them from electoral disaster in November. They think this will rile up the Hispanics, and to fan the flames a few Democrats are making free with their favorite epithet against those who oppose them, Nazi. The politics of illegal immigration are a losing proposition for liberals (one can see that in the resort to euphemism), even if they don’t quite see it that way. Here are ten considerations why. First, there is the simplicity of the argument. One either wishes or does not wish existing law to be enforced. If the answer is no, and citizens can pick and chose which laws they would like to obey, in theory why should we have to pay taxes or respect the speed limit? Note that liberal Democrats do not suggest that we overturn immigration law and de jure open the border — only that we continue to do that de facto. Confusion between legal and illegal immigration is essential for the open borders argument, since a proper distinction between the two makes the present policy indefensible—especially since it discriminates against those waiting in line to come to America legally (e.g., somehow our attention is turned to the illegal alien’s plight and not the burdensome paperwork and government obstacles that the dutiful legal immigrant must face). Why Wave the Flag of the Country I Don’t Wish to Return To? Second, often the protests against enforcement of immigration law are strangely couched within a general climate of anger at the U.S. government (and/or the American people) for some such illiberal transgression (review the placards, flags, etc. at May Day immigration rallies). Fairly or not, the anger at the U.S. and the nostalgia for Mexico distill into the absurd, something like either “I am furious at the country I insist on staying in, and fond of the country I most certainly do not wish to return to” or “I am angry at you so you better let angry me stay with you!” Such mixed messages confuse the electorate. As in the case with the Palestinians, there is an effort to graft a foreign policy issue (protecting an international border) onto domestic identity politics, to inject an inflammatory race/class element into the debate by creating oppressors, victims, and grievances along racial divides. Third, Mexico is no help. Now it weighs in with all sorts of moral censure for Arizonians — this from a corrupt government whose very policies are predicated on exporting a million indigenous people a year, while it seeks to lure wealthy “gringos” to invest in second-homes in Baja. The absence of millions from Oaxaca or Chiapas ensures billions in remittances, less expenditures for social services, and fewer dissident citizens. But the construct of Mexico as the concerned parent of its own lost children is by now so implausible that even its sympathizers do not take it seriously. Mexico has lost all credibility on these issues, expressing concern for its own citizens only when they seem to have crossed the border — and left Mexico. Fourth, there really is a new popular groundswell to close the borders. Most against illegal immigration, especially in the case of minorities and Mexican-American citizens, keep rather mum about their feelings. But that silence should not be interpreted as antagonism to enforcing the law. Many minorities realize that the greatest hindrance to a natural rise in wages for entry level jobs has been the option for an employer to hire illegal aliens, who, at least in their 20s and 30s, will work harder for less pay with fewer complaints (when sick, or disabled, or elderly, the worker is directed by the employer to the social services agencies and replaced by someone younger as a new cycle of exploitation begins). In this context, the old race card is less effective. The general population is beginning to see not that Americans (of all races who oppose illegal immigration) are racist, but that the open borders movement has itself a racially chauvinistic theme to it, albeit articulated honestly only on university campuses and in Chicano-Latino departments, as a sort of “payback” for the Mexican War, where redress for “lost” land is finally to be had through demography. You are currently browsing the The American Catholic blog archives for April, 2010.